Pioneers in the industry, we offer allen cooper ac 9005 antistatic steel toe brown safety shoes and allen copper safety shoes from India. 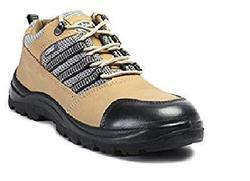 We "New Milan Footwear" are the most appreciated and reliable Manufacturer, Trader and Supplier of Industrial Safety Shoes, Casual Safety Shoes, Ankle Safety Shoes, Safety Footwear, Safety Gumboots, Allen Copper Safety Shoes, PSL Safety Shoes and many more. We offer our products with supreme quality and at market reasonable rate to our premium clients. We majorly deals in Bulk Quantity.